Warm and pleasant; at the age of history, its beauty and originality. It ties our souls to all over of Iran; east Azerbaijan, Ardabil, Kurdistan, Fars, Kerman, Hormozgan and more. 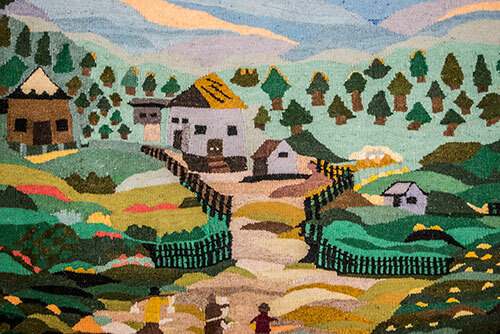 The rhythmic sound of lullabies and whispers of tribal and rural women and girls, who weaves it with love, can be heard in between green and yellow and red yarns and thousands of colors. “Gelim” or “Pelas” is the ancient Iranian art dating back to about 2000 years before Christ (B.C.). A woven clothfull of enthusiasm and titivation and peace with brick and linear design and… that has taken place in the heart of tasteful girls in this center. Our girls come together in Gelim workshop which is full of yarn and design and loom every morning and weave; their enthusiasm and happiness is interesting while weaving.... Their friendship too... Gelim weaving together, ties firmly friendship and companionship between them. We can feel this sense of quiet and lively space of the workshop… . This relaxed and lively atmosphere of the workshop can be felt.... On the ground and next to their chairs are filled with small colored yarns. Their trainer is beating by Daftin on the warp and weft. One of the girls has taken a quiet large skein of yarnin her hand and rolls all left yarns around it. Girls are really busy! These talented weavers of this house give a lot of their work (Gelim) that has been taken months to weave them to those who have come or will come to see them. Then theseproducts, rug from our house to the house of our guests... we are encouraged by the memory of their coming and visiting them again and we are encouraged to make new friends and good prayer. ..
Ms. Assar; gifted and tasted trainer Gelim workshop says: “This workshop began to train clients with a small number of girls in 2004. At first all clients were familiar with tissue techniques, materials, tools and large and small devices in training and orientation classes. 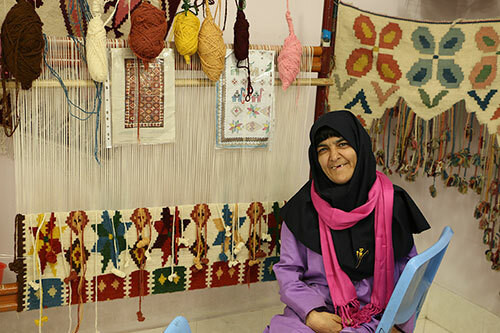 After considering their ability in pilot production and sufficient experience in Gelim weaving, they were prepared for weaving designs and patterns of different sizes, and then they were learned designing and map reading and how to use the different colors in the background in several courses. Ms. Assar says that by the grace of God, we increased the number of machines to 12 in one and more clients have been covered. Clients in Gelim workshop arefrom 12 to 50 years old and Ms. Assar has shown her skill, enthusiasm and patience in training clients. In the colorful workshop of this charity Gabbeh , Gabbeh design, Qashqai Gelim, pictorial carpet, relief carpet, prayer rug, kerchief and mirror frame are made with gifted and capable girls’ fingers. Ms. Assar continued "beside our production activities and the coordination with the Department of Cultural Heritage Office of Crafts, art students receive ID cards and have been a member of handicraft office. Another set of activities, coordination with the Office of Khorasan Razavi province of vocational skills for getting certificate. Hopefully all the weavers have been successful in this stage also received a certificate in skill. " To encourage the carpet weavers of our house, in the course of the production of all clients go to the market with their trainer and with the help of donors and with the market's cooperation, they buy some clothes as wish. Ms. Assar narrates one of her sweet memories during this ten-year partnership with Hamdam "You know that our girls have good intentions and genuine relationship with God. Sometimes certain things happen here... One of the clients had a dream to travel to Kish Island. Two days later, her dream came true. One of the donors sent her and other girls to the island. " Persian: Gelim, Azerbaijani: Kilim, Turkish: Kilim) are flat tapestry-woven carpets or rugs produced from the Balkans to Pakistan. Kilims can be purely decorative or can function as prayer rugs. Modern kilims are popular floor-coverings in Western households. 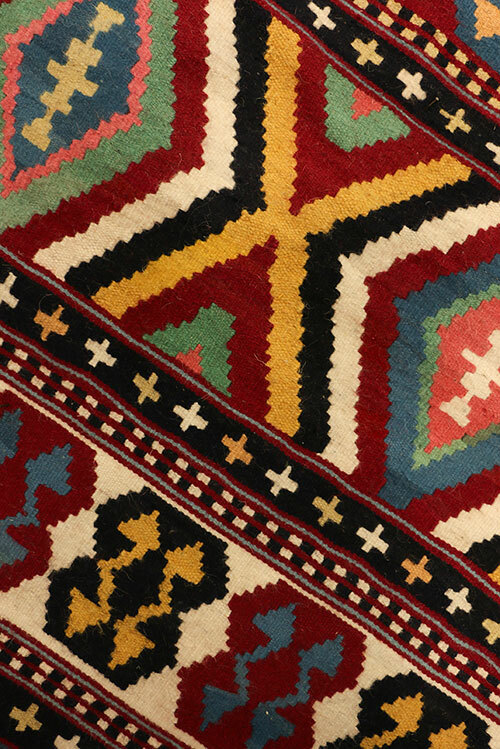 The term 'kilim' originates from the Persian gelīm where it means 'to spread roughly'.